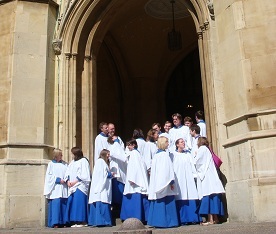 Choral scholars must be in full-time education, no younger than eighteen years of age, and are appointed for one year at a time; scholarships can be renewed year on year by mutual consent, if appropriate. Good sight-reading is essential. The choir rehearses on Friday evenings from 7.00 - 8.15 pm and sings Eucharist (10.30 am) and Evensong (3.00 pm) on Sundays, with rehearsals at 9.30 am and 2.00 pm respectively. The choir does not sing on the Sundays after Christmas and Easter, nor in August. Please contact us immediately in order to arrange an audition if you are interested in applying. The choir employs professional musicians as Director of Music and Organist, but is rare amongst London choirs in being one of the few that consists entirely of volunteer singers. The dedication and enthusiasm of everyone in the choir allows us to work with a broad and ever-expanding range of music. We often attract students that have recently graduated from university who are looking to continue singing in a choir that is similar to the one they may have just left - many of them then stay for years! 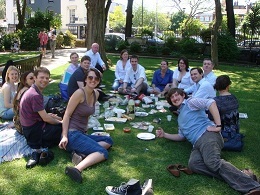 Above all, we are a fun, sociable group which welcomes singers of all ages and from all walks of life.